GoldenEagles.net has no official affiliated with The University of Southern Mississippi. Southern Miss’s graduation rates have continually improved and the program was nationally recognized by the American Football Coaches Association in four of the past five years. Southern Miss players have earned All-American honors 44 times, including at least on All-American in each of the past 11 years. Southern Miss has had nine freshman All-Americans in the past 11 years. HATTIESBURG -- Alan Howze doesn't carry himself like a player who went through an rough season a year ago. Howze, an Ocean Springs native, was also part of Southern Miss' 12-win C-USA championship team in 2011. The 6-foot-3, 227-pound linebacker is looking to help that Golden Eagle pride return this season. ''You have to be proud,'' Howze said. ''As an athlete, your biggest trait is being able to forget. Whether it was 12-2, like we were a couple years ago, or 1-11 like last year, you have to forget the past. 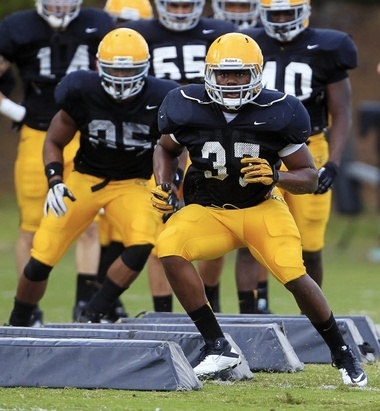 Second-year head coach Todd Monken, the former offensive coordinator at Oklahoma State, said he believes the Golden Eagles will be much improved on defense, with Howze leading the way. ''Alan is a guy who leads be example,'' Monken said. ''He is a prideful guy and a very smart guy who doesn't do a lot of talking." Howze was also instrumental in the hiring of Southern Miss defensive coordinator Dave Duggan, Monken said. Before spending last season at North Carolina, Duggan was co-defensive coordinator at Southern Miss and served as linebackers coach during the 2011 championship season. Howze, a running back in high school, was solid last season in his first year starting at middle linebacker. Starting all 12 games, he collected 66 tackles, five tackles for loss and 2.5 sacks. When the horn sounded in a season-ending 42-24 loss at Memphis, personal achievements were not on Howze's radar. Redemption was, however. ''I thought I would have more than 66 tackles,'' Howze said. ''But at the end of the day, it's all about the wins and losses. To have what happened to us last year was very disappointing. Golden Eagles inspired kids at Dubard School. Every August, Todd Monken and the Golden Eagles visit the Dubard School and bring excitement to a group of local students. "Who doesn't like being around kids," says Southern Miss head football coach Todd Monken. "It's always good to see a smile on kids' faces," says Southern Miss running back Kendrick Hardy. "He and the players did a fantastic job of pumping up our children, not just for Golden Eagle football, but for learning," says USM DuBard School for Language Disorders Director Maureen Martin. The team continues the Black and Gold Day tradition that started before the students were even born. "We've been doing this over 15 years - back to the Coach Jeff Bower days, and he's the one that started this and it's become a very important tradition for the DuBard School and our calendar every year," says Martin. But Monken says the annual tradition is important to him as well. "It means a lot and it means a lot to have our players be able to take the time and come over, and I think it's a humbling experience," says Monken. Monken traditionally takes a dozen players with him to this annual event. Last year, it was an inspiring experience for one student. "You need to continue on your dreams, to whatever you want to be," says 11-year-old student Mark Holland. Mark says he wants to be a football player, something he knows he will have to work hard for - just like his new role model. "It was great meeting Monken," says Mark. "He was a great guy, and I know he worked very hard to become the coach. I salute you."